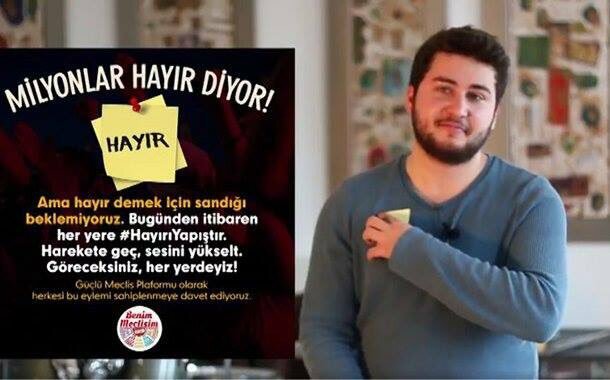 Twenty-one years old university student Ali Gül, who appeared in a popular No campaign video in the run up to the April 16 presidential referendum, has received 2 years and 17 days of suspended jail term. The catchy video titled “What does a ‘No’ mean?” was quickly shared by thousands of social media users after it was first released on Mar 8. Gül pointed to the absurdity that President Recep Tayyip Erdoğan and the government bill millions of potential ‘No’ voters as terrorists overnight. Under arrest since Mar 21 for allegedly insulting Erdoğan on a Twitter account, claimed to be controlled by him, Gül was released after his first hearing on May 16 during which the court sentenced him to 1 year, 2 months and 17 days in jail on charges of insulting the president, and to an additional 10 months for insulting a part of the people on the basis of religion, sect and gender difference. The court suspended Gül’s sentence. A constitutional amendment that gives more power to Erdoğan was approved by a slight majority on April 16, although debates over alleged voting irregularities have yet to ease. The opposition and international observers say as many as 2.5 million voters could have been “manipulated,” effectively changing the result.